Insulation – Roof Mechanics & Company Ltd.
What is the R-Value of your rFoil ™? R-Value indicates resistance to heat loss, and measures a mass insulation’s ability to slow down heat flow through it. R-Values tell how well a product absorbs and holds heat energy, not how well it redirects it. rFOIL™ works by reflecting heat energy back in the direction of its source, and rFOIL™s true performance is not measured by the R-Value. Just as the absorbency of a raincoat is unrelated to its ability to repel water, the R-Value of rFOIL™ does not fully measure its ability to insulate and redirect heat energy. NOTE: All materials have three separate R-Values, as above, depending on the direction of the primary heat source. Most insulation manufacturers do not provide all three values when labelling their products. How well does rFOIL™ work compared to fibreglass? rFOIL™ will stop 97% of Radiant Energy (heat that is radiating through the air in its direction). Radiant heat is often overlooked and misunderstood, often because R-Values do not take it into account. Radiant heat transfer is responsible for up to 75% of total building heat gain or loss. Traditional Insulation products such as fibreglass, cellulose and EPS foam board are effective in reducing CONVECTION and CONDUCTIVE heat transfer, but do little to prevent RADIANT heat transfer. Radiant heat energy can either be absorbed or reflected. rFOIL™ contains aluminum, which has an excellent reflective surface that effectively redirects this energy component. Simply put, this is heat energy that is radiating through an air space. If a surface is hotter than the adjacent airspace, it will cast off its energy, in the form of heat rays, into that airspace. These rays are invisible, yet they are powerful. Consider that temperatures in a dark attic can reach above 150 degrees, when the outside air is only 95 degrees. This is because the sun is saturating the roof with intense energy, which radiates into the attic below. This attic stays dark, but the energy released inside is intense. Now consider what happens in a metal building. The roof absorbs the sun’s energy continuously throughout the day. Since energy cannot be created or destroyed, it can only be transferred or redirected. The metal casts this energy into the metal building in the form of invisible rays or energy. This energy manifests itself as heat when it strikes objects inside the building, including people. This, in turn, heats the surrounding air. The result is hot, stifling conditions inside the building. The energy that is radiating into the building is mostly unaffected by mass insulation products. These materials absorb this energy, build heat themselves, and then cast this energy into the building. As the sun continues to provide energy, the interior of the building continues to receive it. This energy can, however be controlled. Aluminum has the ability to redirect these invisible rays. This is why aluminum is used to insulate airplanes, the space shuttle, and even the spacesuits worn by astronauts. Without reflective materials, an astronaut would perish in space. NASA even credits reflective insulation for allowing man and equipment to withstand the harsh environment of space orbit, where temperatures reach over 400 degrees in the sun, and less than minus 200 degrees in the dark. When installed in metal buildings rFOIL™ effectively redirects the energy that radiates from the underside of the metal. A substantial portion of this energy is reflected upward, and not allowed inside the building. How does the cost compare to 3” fiberglass? Typically, rFOIL™ Double Bubble is priced very closely with 3” fibreglass, depending on the supplier of the two products. How can rFOIL™ insulate if it’s so thin? It’s a common misconception that insulation must be THICK to perform. This is because R-Values are closely related to a product’s thickness. If you have two similar products with different thicknesses, the thinner of the two will always have a lower R-Value than the other. It is also a common mistake to ONLY consider a material’s R-Value when choosing insulation. It’s highly possible for a thinner reflective material to provide better thermal performance than a thicker non-reflective product, even though the thicker product will have a higher R-Value. Except for gold and silver, pure aluminum is the most reflective material on earth. The thin aluminum layer reflects radiant heat energy, and this ability is unrelated to the product’s overall thickness. Does rFOIL™ keep a substance cool too? rFOIL™ does not necessarily cool a substance. Rather, it keeps it from getting hot. 3. The last insulated with foil. A bag of ice was placed in each box and its rate of melting was recorded. In the boxes insulated with fiberglass and foam, the bags of ice took 24 hours to melt. The bag of ice placed in the box lined with foil took 4 days to melt! This test clearly exposes the fallacy of the r-value test: A high r-value does not necessarily mean a better insulator. Depending on the application rFOIL™ can be installed in numerous ways. 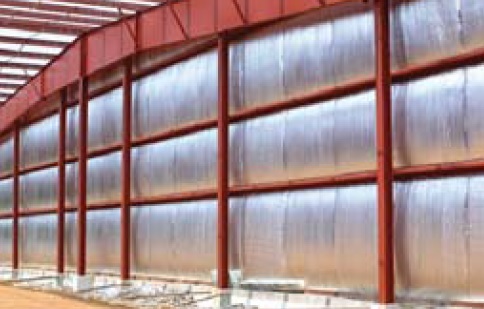 In pre-engineered steel buildings, rFOIL™ is installed either above or below the purlins supporting the metal roof and sidewalls. 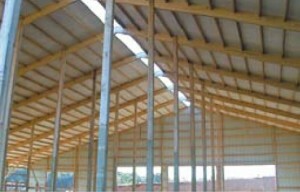 In new construction, it’s most often installed on the outside of the purlins. rFOIL™ usually runs perpendicular to the purlins, and in the same direction as the exterior metal. In retrofit applications, it is easiest to install rFOIL™ directly to the inside of the purlins, and running parallel. rFOIL™ requires an airspace, ideally at least ¾”, to effectively redirect heat transfer. This is easily accomplished when installing over purlins spaced 5’ apart, since the products own weight creates a natural drape of 2 ½” along this span. UNDER CONCRETE: When installing Ultra CBF or Concrete Underpad, it is important that the clear poly side face upward, to provide a thermal break so radiant heat can be reflected back. An adverse chemical reaction could occur between the lime contained in concrete and the aluminum should the lime come in contact with the aluminum, which would then delaminate. All rFOIL under concrete products have a poly coating protecting the foil surfaces. Can the bubbles go flat after rFOIL™ is installed in a building? The bubbles in rFOIL™ contain air when the product is manufactured, and it will maintain this air indefinitely. 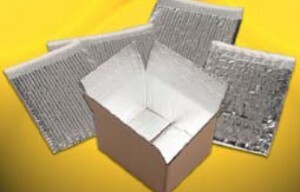 rFOIL™ is produced with high-quality, linear-low density polyethylene, which is an excellent air barrier. And since the air pressure inside the bubbles is exactly the same as the air pressure outside, there are no forces in place that will cause the air to escape. What if the bubbles lose their air? It is highly unlikely that any of the bubbles will ever lose their air, given the equal air pressure both inside and out, and due to the quality of polyethylene used. However, it is possible for bubbles to be punctured by a sharp object. However, each bubble is independent of the other, so if one is punctured, the others will still maintain air. Will rFOIL™ prevent condensation? If so, how? Yes, rFOIL™ is an outstanding solution to condensation problems. The thermal break provided by the air space prevents warm, moist air inside a building from interacting with cold air on the other outside surface. When installed correctly, with secure seams, condensation will not occur on the surface of rFOIL™. Can I lay the metal down directly on the foil? Yes. Theoretically, if it were possible to achieve 100% surface contact with rFOIL™ and the metal exterior, the performance of rFOIL™ could be compromised. However, two factors prevent this from ever occurring in metal building installations. First, the natural weight of rFOIL™ makes it easy to achieve the necessary drape to ensure optimum performance. When pulled tightly during installation, rFOIL™ will naturally drape 2 ½” when spanning purlins spaced 5’ on center. Second, the ribbed profile of exterior metal adds to the airspace already in place. Also, rFOIL™ provides a thermal break where the exterior metal attaches to the purlins. The only conductive transfer that occurs is via the screws that attach the exterior metal to the purlins. Do I need to tape the seams? Taping the seams is highly recommended, especially as interior condensation is an issue. Heated metal buildings in colder climates are especially susceptible to condensation problems, as well as agricultural buildings housing livestock. If there are no concerns about interior condensation, taping the seams is an option. As a rule, taping the seams is recommended. What is the best way to tape the seams? Generally, it is always easier to tape seams from above, just before attaching the exterior metal to the purlins. The most common method for taping seams with 5’ purlin spacing is to install double-tabbed rFOIL™ before attaching the metal. Both tabs are brought upward together, and often stapled every 1-2 feet. Foil tape is then applied atop the tabs. This method also helps the adjacent rows stay together as pressure is applied to the tape. 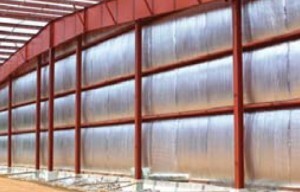 rFOIL™ Quick-Seam is another popular option, especially in post/frame buildings. Quick-Seam is a single-tabbed product, with double-coated tape on the interior side of the tab. When installed, the tab overlaps the next row of rFOIL™, the contact strip is removed from the material, and the tab is pressed into place on the adjacent material. Once attached, no other steps are necessary, and a secure vapour barrier is in place. When spanning purlins spaced 5’ apart, installing rFOIL™ Quick-Seam is slightly more difficult, but the convenience of not applying tape separately is a plus. In this case, it is important to maintain a consistent drape with each row, to ensure adequate surface contact for the tape. Also, when pressing down on the taped seam, it’s also helpful to have someone pushing from below to provide resistance for the tape to make full contact. How much tape will I need? First, determine how many linear feet of rFOIL™ is being installed. This is approximately how much tape you will need. However, remember to allow at least 20% for tape overlap, scrap, etc...Rolls of rFOIL™ Tape are available in 2” or 3” widths, and lengths of 150’. What kind of tape works best with rFOIL™? 1. Aluminum rFOIL tape to seal the seams of the aluminum rFOIL products and Reflective rFOIL tape to seal rFOIL made with metalized polyester. To meet the new Class 1 Class A fire codes most rFoil products are made with Reflective metalized polyester. Products made with aluminum ( Class 2 Class B fire rating ) are generally made for specific applications. 2. White Poly tape to seal poly-facing seams. 3. Double-sided tape to attach the first course of rFOIL™ to the roof edge, or for use with Quick Seam applications. Can water get inside the bubbles of rFOIL™? No. Each bubble is independent of the others, and polyethylene is a natural moisture and vapour barrier. How easily will the product tear? rFOIL™ is produced with linear-low density polyethylene, with very high tensile strength and puncture resistance. When handled properly, it is very difficult to tear the material. When using rFOIL™, how can I achieve an R-10? A system R-10 is obtained by installing rFOIL™ alone in a metal building. When using rFOIL™, how can I achieve an R-19? A system R-19 is obtained by installing rFOIL™ in conjunction with 3” unfaced fiberglass. When using rFOIL™, how can I achieve an R-30? A system R-30 can be obtained by installing rFOIL™ in conjunction with 6” unfaced fiberglass. In this application, the 6” fiberglass is installed between the purlins, and the rFOIL™ is attached directly to the bottom of the purlins. The result is an attractive, consistent ceiling surface, with tremendous thermal properties. Will the material degrade or break down? rFOIL™ is made from polyethylene and either metalized polyester or aluminum. Both of these materials are very environmentally stable, which means they do not biodegrade quickly. Reflective products designed for an exposed application will have UV and FR inhibitors in their composition. Can I spray wash the material? Yes, you can keep the surface clean by spray washing the insulation. However, power washing is not recommended. How do animal fluids (urine) affect the white side? The Foil side? Both the white poly side, and the foil side of rFOIL™ are unaffected by animal fluids. Both materials are non-porous, and chemically stable. There is no interaction of degradation that occurs when contact is made with animal urine and fluids. How is the rFOIL™ installed with standing seams? As with traditional metal roofing, rFOIL™ is installed directly onto the purlins. Installation procedures do not change when used with standing seams. What is the fire rating of the product? Is this product a fire hazard? No. The material is more prone to melting during a fire, rather than adding to the burning of the structure. rFOIL™ is produced with aluminum or metalized polyester and polyethylene (plastic). None of these materials is a fire hazard. Will dust affect the foil’s performance? Layers of dust do have an effect on the material’s ability to reflect radiant energy. The degree of reduction in reflectivity has been debated scientifically. Conclusion ranges from 7% to 18% reductions in reflectivity over 10 to 25 years. Will the foil make my metal hotter than without? The heat energy that the metal receives comes directly from the sun. No new energy is being created. Only existing energy, which has already been absorbed by the metal is reflected back toward the source. Will rFOIL™ corrode or change color? rFOIL™ is produced with 99.9% pure aluminum or metalized polyester. These are the purest products available on the market. They are highly resistant to discoloration or corrosion. Less than pure aluminum contains filler materials. Often, it is these fillers that are discolouring, not the aluminum content itself. For this reason, rFOIL™ is always produced with the highest quality products available. rFOIL™ is also coated with a clear resin to further protect the integrity of the surface. What if it rains on the material before it is installed? De-ionized water (rainwater) has no affect on rFOIL™. Will the material tear at the screw holes? No. The many layers of polyethylene add to the strength of the product and will resist tearing.